Let’s see…you don’t want your son or daughter to be bored in the house, you want them to participate in fun recreational activities, and you don’t mind them being tired at the end of the day?… Well, we have just the thing for you, and them! 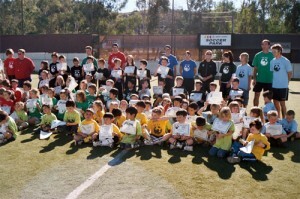 The North County Soccer Park has been running fun, recreational soccer camps for over 18 years. Our coaches have made careers of helping kids have fun and improve their soccer abilities. Our drop-off camps, run Monday-Friday from 8:00-11:00am. Parents may stay if they wish but are not required too. Each week of camp cost $130 per camper. Registration includes age appropriate instruction, in groups created with a 12:1 or 10:1 ratio of campers to coach, a free camp shirt, a free concessions drink every day, and a personalized award certificate on the last day. *Age requirements for all camps are below. * ALL CAMPS ARE HELD AT NORTH COUNTY SOCCER PARK IN POWAY. A friendly atmosphere which is conducive to learning while having fun. All camps are held at NCSP, in Poway. or call us at 858-748-4260.